In February 21,1613 a great event occurred in Russian history. A representative assembly of All Classes of the Land (Vsesoslovny Zemsky Sobor) elected Mikhail Fyodorovich Romanov to reign Russia. The Sobor, followed by Moscow as well as by other Russian towns, swore allegiance to Tsar Mikhail for "...the Tsar was elected by God Himself, and the whole Land of Russia was rejoining and exulting". Under the Stolbovsky Peace Treaty (concluded with Sweden in 1617), Russia relinquished her possessions on the Baltic Sea coast. During the reign of Mikhail Fyodorovich, coast-dwellers' navigations in the Arctic Ocean became more intensive; a number of geographical discoveries were made by Dezhnev, Poyarkov, Khabarov, etc. At the same time, coastal trade was restricted and foreign merchants' ships were admitted up to Arkhangelsk only. Mikhail Fyodorovich Romanov (1596-1645). Ruled from 1613 to 1645. 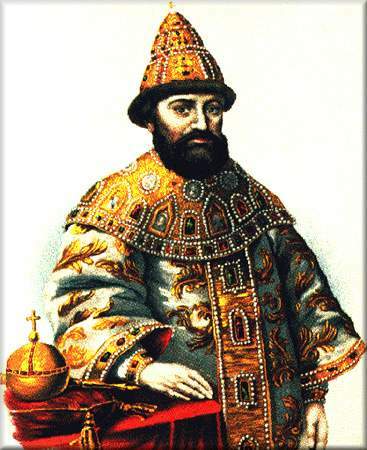 In 1633 the Duke of Shlezvits-Golshtinsky Friedrikh III applied to the Tsar for a permission to build ten ships for a trade in silks with Persia. Permission was granted, though with the condition "...to hide no ship-building know-hows from Russian shipwrights".